Early in 2017, I wrote about Setapp, an intriguing subscription service that provides access to a slew of carefully curated Mac apps for a $9.99 monthly fee (see “Setapp Offers Numerous Mac Apps for One Monthly Subscription Fee,” 25 January 2017). Just as Netflix does with video and Apple Music does with songs, Setapp’s pitch is that $9.99 per month ($120 per year) will be less than you’d spend on buying and upgrading apps individually. Setapp Numbers — Nearly halfway through Setapp’s first year, it’s time to take a look and see how it’s doing. Most notably, the number of apps available to subscribers has grown from 60 to 77 (from 69 developers), providing users with lots more functionality without sacrificing quality or providing many nearly identical apps. No one would buy all those apps, of course, but if they did, it would cost $2437. Julia Petryk of MacPaw tells me that Setapp now has 10,000 paying users and another 200,000 people who are using it in the free 30-day trial mode, which can be extended by encouraging a friend to sign up. Those aren’t Apple-level numbers, of course, but they’re respectable for just a few months. I polled a few developers who are participating in Setapp, and although all of them remain optimistic about Setapp’s potential, Setapp hasn’t contributed significantly to the bottom line for any of them. Joe Japes of Econ Technologies estimated that the inclusion of ChronoSync Express in Setapp had increased revenues by less than 1 percent. Jesse Grosjean of Hog Bay Software told me that putting TaskPaper in Setapp had been a “nice but relatively minor boost” that generated about 5 percent of his monthly revenue. Setapp and App Discovery — The biggest problem Setapp faced initially — apart from simply being a new concept — was that of app discovery. With 60 apps at first, and now 77, how could you even figure out which apps you might want to use to solve a particular problem? In my introductory article, I noted that browsing through the apps listed on Setapp’s Web site was easier than opening each one in turn in the Finder. No longer. MacPaw’s first swipe at this problem came a few months ago, when Setapp gained a catalog-like interface to separate all the apps into categories and call out those that you’d already installed. Each app received a brief summary and a full description, complete with screenshots. Forecast Bar provides hyper-local weather information in your Mac’s menu bar. I love Dark Sky on the iPhone and Forecast Bar looks like it will give me single-click access to similar information on my Mac. I installed it immediately. Capto from Global Delight is a capable screenshot and video capture utility for the Mac. I prefer macOS’s built-in screenshot capabilities coupled with editing in Preview, and I usually use QuickTime Player for screen recordings, but it was a good recommendation. ChatMate for WhatsApp isn’t something I have much interest in, purely because I don’t use WhatsApp for messaging, but since I do use Messages, Google Hangouts, Skype, FaceTime, and more, it’s not a bad suggestion. Timing looks like a useful time-tracking utility, and since I’ve long had RescueTime installed and have just started testing Qbserve, it’s also a good recommendation. Perhaps I’ll have to do a three-way comparison. Also on the My Dashboard screen are new arrivals and updates, which help you stay aware of how Setapp’s collection is expanding and improving over time. Setapp for Users and Developers — Does SetApp make sense for users? It’s a great way to sample a lot of apps, even if you aren’t going to use that many of them in your everyday routine. In fact, I’d suggest that much of the value comes in apps you need to use only infrequently and thus wouldn’t buy. Julia Petryk of MacPaw said that the average Setapp user installs 10 to 12 apps. For instance, the only app in Setapp I use all the time is iStat Menus because I like its menu bar performance graphs. But I’ve used Gemini to eliminate duplicate files a few times and Permute to convert video files to other formats. At a conference, I saved another speaker’s bacon by using Downie to download a YouTube clip so he could embed it into his Keynote presentation. I checked out iMazing to answer a reader’s questions about extracting SMS text message conversations and voicemails from an iPhone. I also tried SQLPro Studio but decided that for what I need, the open-source phpMyAdmin is fine. The beauty of Setapp for users is that it’s entirely optional, so if you feel it offers sufficient value for your $9.99 per month, give it a try. And if you’re not a fan of subscriptions, stick to buying the individual apps you need. If you’re a developer, should you try to get your app into Setapp? That’s a tougher question. As Joe Japes told me, you have to weigh the pros and cons to make sure that participating in Setapp won’t cannibalize sales. For higher-priced apps, as with Simon, the subscription might bring in enough new users due to the lower price point to make up for the loss in direct revenues. And it’s a way that you could add a subscription option without having to roll the technology yourself. Other SetApp developers with similarly low revenue increases expressed the worry that, as MacPaw brings additional compelling apps to Setapp, the per-user payout will have to be split between more developers. So that’s a tension, then. From the user perspective, you want to take advantage of as many apps as you can to ensure you’re extracting the most value from your subscription. Each developer participating in Setapp, however, would prefer that you use their app and as few others as possible, so the revenues are shared between only a few developers. 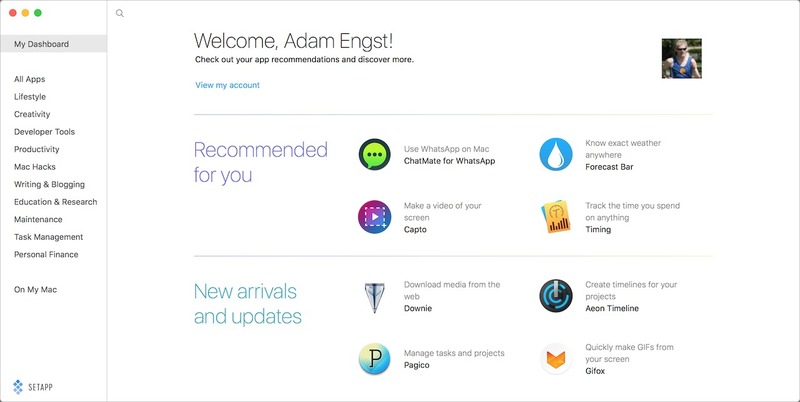 And MacPaw is in the middle, wanting both to bolster Setapp’s perceived value to users by adding more apps and to keep developers happy by increasing revenues. No one ever said that rethinking an entire business model would be easy. I am proud to subscribe to, and receive tidbits. With no offence intended, may I just point out that your audience is potentially world-wide and that many of the apps - forecast bar is a prime example - are of minimal use in the UK. Sure I can buy it here from the UK App Store, but its coverage of the UK verges on the hopeless. And this is even more obvious if you live outside a major city. A caveat about coverage would be helpful. We try to be sensitive about international issues, but there's a limit to what we can know. Forecast Bar, for instance, seems perfectly happy to provide forecasts for London in both the UK and Ontario. If its forecasts do exist but aren't great, that's nearly impossible for us to discover in advance (but easy for users to note in comments to help other readers). MacPaw is based in Ukraine, so I'm sure they're aware of app that are too U.S.-centric as well. I appreciate your kindness and time in replying. I understand the sensitivities involved. You also make a valid point about comments from users. If you need an app for a short time, it may be a good choice. But if it is one of your core app, subscriptions result in paying forever. Take MS Office for instance; over 10 years you would have paid $1200.00 for it, and you would still be paying. Not only that if you have files that depend on the app to open, ending the subscription means you lose access to the data or you have to buy it anyway & and your previous investment is lost. What happens if the service shuts down? Either you permanently lose valuable data if it involves off line storage or you have to once again, buy the app or lose your data..That's why ANY subscription based service turns me off. I am of the opinion that subscriptions for short time related items such as periodicals or other consumables, but not for computer related services such as Apps, or archiving. Consider the possible consequences of having grave sites on a subscription service and for some reason the bill fails to get paid.